The home of Petrona Villasboa is surrounded by genetically modified (GM) soy fields. The golden crop looks like a bumper harvest but for her it is a symbol of death. “Soy destroys people’s lives,” she says. “It is a poison. It is no way to live. Soy is deadly to us”. 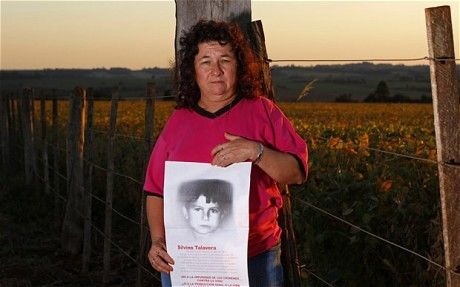 Sitting outside her painted green shack in rural Paraguay, the mother of eight describes the day in January 2003 when her 11-year-old son Silvino Talavera came home from cycling to the shops. “I was washing clothes down by the river and he came to tell me he had been sprayed by one of the mosquitoes (the spraying machines behind a tractor),” she says. The busy mum did not think much more about it. For people living around GM soy fields spraying with chemicals is a common occurrence. But later that day the whole family was ill after eating the food Silvino had brought from the shops. Petrona rushed her youngest to hospital and by the time she was back the usually healthy child was in bed rigid with pain. Now in a blind panic, she begged local farmers to take her to hospital. “He was violently sick, he said mummy, my bones ache, his skin went black,” she says. By the time they arrived in the city Silvino was paralysed, all the doctors could do was administer pain killers, while his mother wiped the foam from his mouth. In a few hours he was dead. To the family it was clear this horrific death was caused by chemical intoxication but in their grief no autopsy was ever carried out. It was only after years of campaigning that Petrona managed to get the case to court. Eventually two local farmers were convicted of causing the death, though it is unclear whether they have ever been sent to prison. Like many court cases in Paraguay there are serious unanswered questions. But Petrona is sure of one thing, that her son’s death was caused by GM soy and we should listen to her because we are eating it. Daily Telegraph investigations have found that every single supermarket in Britain stocks meat and dairy from animals fed GM soy. Leading brands including Cadbury, Unilever and Dairycrest, also use products from livestock fed GM. In fact the new technology is so widespread that it is likely at least one item of food you eat today will have come from an animal fed GM soy, whether it was the milk on your cereal or the bacon in your sandwich. But what effect is our growing reliance on soy having on the countries supplying Britain with this ‘invisible ingredient’? Paraguay, a landlocked country in the heart of South America, is on the front line of the new craze for growing ‘green gold’. In many ways it is the perfect place to grow unsustainable soy. Ruled by despotic dictators for centuries, the country is famous for being a hot bed of drug smugglers, Nazi war criminals and even al-Qaeda. Even now, with a new democratically government in place, corruption is rife and regulations to protect the people are lax to say the least. In the last year the amount of land planted with soy has grown to a record 2.6 million hectares, most of which is GM, leading to claims of deforestation, violent land disputes and the ‘poisoning’ of local communities. Already it is estimated that 90 per cent of the Atlantic Rainforest in Paraguay has been lost to make way for crops, taking with it thousands of unique plants species, hundreds of rare birds and endangered animals like the jaguar. There is evidence that soy production is now moving into the vast ‘Gran Chaco’ in the north of the country, the home of some of the last uncontracted tribes on Earth. Its not just animals that suffer, the forests were also home to humans. Groups of Guarani people claim they have been driven from their land by the soy farmers. They can be seen camping in pathetic tarpaulin shacks in the town squares or on the road side. ‘Campesinos’, the small farmers who have traditionally worked the land, also claim they have been displaced. Since the first soy boom of 1990 it is estimated 100,000 farmers in Paraguay have been forced to migrate to urban slums. Like the ‘wild west’, as soy production moves into new areas there have been violent clashes between land owners and peasants occupying the land. Many of the ‘invaders’ are from Brazil or the even more alien Mennonites, a religious sect from Germany. Amnesty International say fights over land has led to several deaths, thousands of arrests and hundreds of injuries. It is now common to see armed guards protecting the soy fields 24 hours a day. Those peasants who have clung to their land claim, like Petrona, that they are being “poisoned” by the ‘mosquitoes’. Most of the crop in Paraguay is GM and requires spraying with agrochemicals. Just as in the UK, farmers are expected to follow certain regulations when spraying fields such as leaving a space between homes or school playgrounds. ‘Live’ barriers of trees should be planted to protect communities and spraying is not allowed in strong winds or hot conditions. However growing evidence of contamination, poisonings and even deaths suggest the rules are not being followed. Farmers are also reported to be using compounds that are outlawed in Europe such as the 2,4-D or combinations of chemicals that could be dangerous. Dr Stela Benítez, a paediatrician at Asuncion University, carried out a study in 2006 summarised in a respected American paediatrics journal, that found women living within 1km of sprayed fields were twice as likely to have a child with deformities. She is quite certain that there is a risk and the regulations should be applied when spraying close to people’s homes, after all there are rules in Europe, so why not protect people in poorer countries? “I am worried about a lack of control in an industry that does not apply the principle of protection over all our children,” she says. The flouting of the law seems to be the main problem in a tour of Paraguay with Friends of the Earth to meet some of the victims of pesticides spraying. In Itakyru a whole community was affected when poisons “rained from the sky” and Guarani women and children were rushed to hospital. The chief says Giralda Gauto Vera, 18, and her daughter Giseli, 18 months, were in hospital for four days after the planes came. Later the authorities confirm that aerial spraying should not even be allowed in an area dotted with the dwellings of indigenous people. Dr Angie Duarte, who has treated dozens of patients at the public hospital in Curuguaty for what she believes is “intoxication”, admits that many of the worse affected communities are already suffering from malnutrition, immune deficiency and perhaps even using dangerous chemicals themselves on crops. But isn’t that all the more reason to ensure they are protected? Soy has certainly been in Paraguay’s economic interest over the last year, driving unprecedented growth of 14.5 per cent, ahead of even China. Sweeping his hand across the shimmering fields, Breno Batista Bianchi is confident that it is soy farmers like him that the country has to thank. Of course there are some problems with ‘super weeds’, that build up resistance to chemicals, and outbreaks of disease, but these can easily be solved. “They will invent new seeds, new chemicals,” he says. But this blind faith in progress is not shared by everyone. Paraguay might be providing the soil, water and labour but a tiny percentage of the population see the profits. Soy is not even taxed and most of it leaves South America labelled as ‘Brazilian’ as shipments are mixed in together at the sea ports. Oskar Rivas, the Environment Minister in a new socialist government, says the growth of soy must not be at the expense of the people. Sr Rivas said it is up to the British consumer to demand change. While he accepts it is too late to stop GM being grown in Paraguay, he insists more non-GM could be grown, just as in Brazil where whole states have insisted on a more sustainable system, or at least a more sustainable crop. “You have the right to demand cheap milk and meat but you also have the right to demand milk and meat from environmentally sound sources,” he adds. New initiatives such as the Round Table on Responsible Soy (RTSS), backed by WWF, hope to encourage this sort of production by producing a new label for soy, including GM soy, produced in a sustainable way. Already it has been taken up by major supermarkets in the UK including Waitrose, Asda, M&S and Sainsbury’s although many environmental groups are against a scheme that endorses GM. Sitting in his new office complex, that is currently been dug up to make an organic garden, Sr Rivas sketches out his vision for a country that uses some of the best growing conditions in the world to produce healthy sustainable food. Already Friends of the Earth International are working with local charity Sobrevivencia to teach communities environmental law so they can fight back when communities are sprayed and organic farming techniques so they can make their own food. This page contains a single entry by sal published on May 3, 2011 10:59 AM. Nation's Pediatricians Call on Congress to Protect Kids from Toxic Chemicals was the previous entry in this blog. Are Vaccines Obsolete? is the next entry in this blog.